People love to hate James because he's always on top and because they are sick of him. For seven straight years, James's teams have bludgeoned the competition to reach the NBA Finals with mixed results. This year, however, thanks to a shocking blockbuster trade in the offseason, James watched as the Robin to his Batman, Kyrie Irving was dealt. The ensuing return, which included an injured Isaiah Thomas among others, didn't pan out as the Cavaliers were once again forced to move pieces during the NBA's trade deadline. Flash forward to today and while Cleveland looks to be in better shape than a few months back, they're looking as vulnerable as ever. Pundits and fans alike believe James alone can carry the Cavaliers back to the Finals but even as the greatest player of his generation, James won't be able to overcome the herculean task in front of him. One stat that jumps out: Cleveland's 29th-ranked defensive rating (109.5). Only the hapless Phoenix Suns are rated worse. No NBA team has won a championship with a 29th-ranked defence and you can't simply just "turn it up" once the playoffs roll around. In their last ten games, Cleveland has ranked higher on defence (106.7), good for 19th in the league. But they are still short on rebounding percentage (22nd) and opponents' points in the paint (21st). They are so thin up front they signed journeyman Kendrick Perkins. Beyond their defensive problems, Cleveland lacks a consistent secondary scoring threat beyond James. Kevin Love has quietly scored 17.6 points on 45.8 per cent shooting but he's more of a bonafide spot-up shooter. Guard Jordan Clarkson has his moments but is too inconsistent to depend on. James is averaging his highest assists per game (9.2) and rebounds per game (8.7) and his highest points per game (27.7) since his first season in Cleveland because he's overcompensating as the sole superstar on his team. The competition has slowly but surely crept on the King. The Celtics, amidst a catastrophic season mired with injuries including the loss of three of their top players, have won more games than Cleveland and look even better than last year's version. Even short-handed, they could give James a run for his money. The Philadelphia 76ers are on a 16-game winning streak to finish the season with an overtime victory over Cleveland. And they're doing this without their best player, Joel Embiid. Once he returns, the Sixers could be a matchup nightmare for James. The team is young, athletic, and has the size to beat up on the Cavs. If they weren't so inexperienced, they'd be favourites over Cleveland. Even the unassuming Indiana Pacers, currently at the fifth seed, could give Cleveland problems. The loss of superstar Paul George only seems to have made them better. Shooting guard Victor Oladipo blossomed into his own superstar while the Pacers boast a team better than the sum of its parts. And of course, there are the Toronto Raptors. As the top Eastern seed, they are the NBA's second-best team and are tied for the best home record. James has historically owned the Raptors and won the season series 2-1 but those victories were close and Cleveland shot an unsustainable high percentage. While Cleveland can beat any of these teams in a playoff series, doing it to three of them will be difficult. In 2010, James's Cavaliers finished first in the conference but lost 4-2 to the Celtics in the second round. The following season, he left for Miami. In 2014: James's Heat made their fourth straight NBA Finals appearance but lost 4-1 to San Antonio. James left Miami and returned to Cleveland. James had lackluster performances in critical games during these times. While he still poured in huge numbers, they were all for naught as both his Cavaliers and Heat seemingly "quiet" as they lost each of their final three games and got eliminated. James is often accused of lacking "clutch" but it's more likely he had one foot out the door and was looking ahead to next season. With rumours swirling that James will be signing with the Lakers or Sixers, and the Cavaliers being a patchy team, James could repeat the trend this season. He has already fulfilled his promise to Cleveland and brought home a title. He has nothing left to prove. 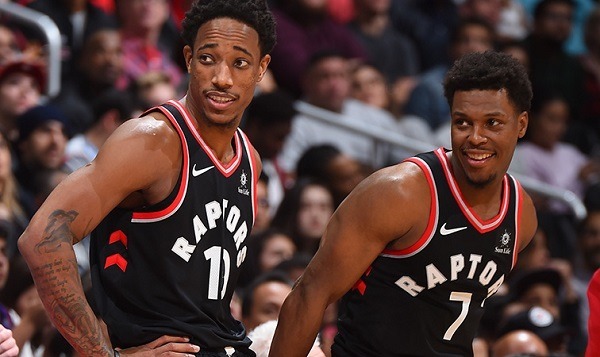 And when faced with considerably tougher opponents, don't be shocked if the Sixers or Raptors eliminate the Cavaliers and end James's Finals streak. As Canadians gear up for the NBA Playoffs, these Canadian-friendly sportsbooks gear up for the NBA fans. Plenty of lines are offered with extensive props fitting for the craziest NBA die-hards.